Obesity in the U.S. is steadily climbing, and as we learn more about what this condition does to overall health, the question is how to help and prevent it. The definition of obesity has slightly changed over time, and there has never been so many people that fall into this category. A new report by the Trust for America's Health and the Robert Wood Johnson Foundation reveals the current state of obesity and recommendations for lowering the rates and treating it effectively. 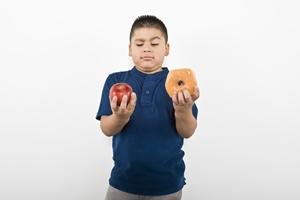 The report found that one-third of adults and one in six children are considered to be obese. West Virginia had a 37.7 percent obesity rate, making it the highest in the country. Mississippi followed at 37.3 percent, while Alabama and Arkansas tied for third with 35.7 percent. While the study certainly reveals obesity as a major epidemic in the U.S., it also gave some promising news. For the first time in the 14 years of conducting the annual report, a state's obesity rate actually dropped, and the rates of increase in other states have slowed. "Obesity rates are still far too high, but the progress we've seen in recent years is real and it's encouraging," Dr. Richard E. Besser, the Robert Wood Johnson Foundation's president and CEO, told The Chicago Tribune. "That progress could be easily undermined if leaders and policymakers at all levels don't continue to prioritize efforts that help all Americans lead healthier lives." "Focus on early childhood to promote exercise and provide healthy meals." Obesity has been proven to lead to future health problems like high blood pressure and heart disease. The report suggested that lawmakers focus on early childhood to promote exercise, invest in community-based programs and improve school efforts to provide healthy meals and physical activities. These initiatives alongside coverage for obesity prevention and treatment could make a big impact on public health. Some counties in the U.S. have already rolled out soda and sugary beverage taxes as a means to earn revenue and encourage healthier habits. The Office of Nutrition Education oversees Supplemental Nutrition Assistance Program Education, which teaches low-income families how to improve their diets, increase physical activity and manage food resources. Daily Journal noted while this effort won't completely solve obesity, it will help change people's mindset, improve the consumption of healthy food and reduce food waste. By using behavioral economics and putting the healthiest food at the front of the lunch line, it can nudge students toward making a healthier choice. Our metabolic factors also play into obesity. One study found that molecular mechanisms can prevent people from feeling full after a meal, causing them to eat more, Medical News Today reported. Finding and treating these types of conditions can lower the obesity rate and improve individual's overall health. The obesity rate in America isn't going to go down overnight. By imparting healthy habits from an early age and teaching adults how to use their food resources wisely, it will be a big first step to tackling the problem head on for a healthier future.